We went back to the basics and reacquainted ourselves with several rules that had helped us in the past. They work. And if all used together are an almost fool-proof way to “find” extra money in your own budget. Get out your pen and paper and commit them to memory. Your food budget is one of the best areas you can cut expenses to make room in your budget for savings. Don’t believe me? Take a look back at your own bank statements. Go back three months and see how much money you spent on food. (Seriously, do that – like right now) Did you look? Are you shocked? OK. So, now you are ready to really get to work. Commit to eating at home and sticking to the budget you have set for yourself. You won’t find anyone here telling you to live on “beans and rice” (although delicious, if you ask me). So be realistic, while at the same time make an honest effort to cut back and meal plan wisely. If you normally were spending $1,000.00, try cutting that back to $600.00. See if you can do it. If not add a little back in. If that was too easy, then cut back some more. Then take those savings and either supercharge your debt repayment and/or your retirement accounts. In our house, we typically have two major shopping “hauls” a month. On these trips, I try to get most everything we need for two weeks at a time. We have a large family – so two times a month works better for us. You may be able to extend this to just one large trip a month. We then have one or two smaller trips in between to replenish things like fresh fruits and vegetables. Studies have shown that people spend more when they use a credit or debit card when they shop. My suggestion for you, especially if you are just beginning your financial independence journey, is to use cash when you shop for groceries. You will spend less. Spending less is the goal – so anything you can do to achieve your objective is preferred. Once the cash is gone – it’s gone and you are done shopping. I have one caveat. IF you are disciplined with credit cards and are diligent about paying them off every month – using your credit card is a good way to collect lots of different types of rewards points. However, this also means that you should still stick to the budget. If you hit your pre-determined amount to spend for groceries, it is time to stop shopping. TIP: A lesson I learned from my mom is to keep a “tally” as you shop. On one-side I have my list and on another I keep a running ledger on how much I am spending. I round up to the nearest quarter. This gives me an automatic cushion for taxes on non-food products and makes it easy to do the math as I am shopping. Contrary to popular belief, shopping is not a recreational sport. From this day forward, all shopping is a planned event. (GASP!) Whaaaaaaat! Yes, it’s true, there will be no last-minute excursions to the store. And definitely no stopping by the grocery store “for a few things” unless you are armed with two things, a list and money left in your food budget. Heading into a store with no plan is like heading into a jungle without a guide and with no protection. You are vulnerable. A store, any store, whether it be a clothing store, a hardware store, or a grocery store, has one purpose – to sell you STUFF. To separate you from the money in your bank account. They go to extreme lengths to do it. But let’s be frank, it’s really not all that hard to do right? I’m guilty of it. Stopping by the store to get “one” thing that is just a few bucks but, somehow, I leave with 25 items and spend $100.00. How the heck does that happen? Because you are not as good at the sport of shopping as the retailer. But you can be. If it’s not on the list, it does not go into your cart. Impulse buys will wreak havoc on your food budget. This is an exercise in two things. First, it helps create discipline, and Second, it helps you get better about planning. Of course, if it’s an absolute necessity – you get it – but you still stick to the budget. DO NOT PAY FULL PRICE, IF AT ALL POSSIBLE. Not everyone is a fan of couponing. We are all busy. I get it. It takes time to collect them, then match them with ads, cut them out, keep them organized, not let them expire etc… So, if you ARE a couponer – you get mad respect from me! My husband and I used to coupon regularly, and even taught others how to do it, but when we moved to Southern California, it became more difficult. Also, several stores eliminated their “double coupons” which really made couponing worth it and then, Walmart stopped price matching. Which totally sucked! T.V. shows like, “Extreme Couponing”, likely ruined it for the rest of us. Ruiners! Keep your grocer ads nearby when you are making your shopping list. Scan them and look for savings on staples like meat, milk, fruits and vegetables. Then, plan your meals around what is on sale. Also stock up. A stand-up freezer to stock up on sale items is something to consider. This step may add a tiny bit of time to your shopping but in the long run the savings is totally worth it. OTHER RULES OF THE ROAD. Eat before you leave the house – if you shop hungry you are far more likely to impulse buy. Do not shop with children. This can be difficult especially if you have little ones. However, I urge you to find a way to shop without them. Try going after they go to bed or after a spouse/partner gets home. Swap with a friend. Then do the same for them. Shoppers tend to spend more when they have children with them. The little crumb-catchers want all the things and can be relentless. Shop the perimeter of the store. Try to avoid going down every aisle. The foods in the middle are more often processed and less healthy. Processed food may last longer but by eating more fresh and whole foods, you will live a healthier life and realize long-term savings in reduced medical expenses. Consider the dollar store for some items. For instance, our local dollar store carries the same bread we would normally purchase at the grocery store for anywhere between $2.50 and $3.00. By purchasing them at the dollar store, I save $1.50 a loaf at a minimum. When we buy bread at the dollar store we purchase multiple loaves at a time (sometimes 10 or more) and freeze them until we need them. By doing it this way, we can save between $10.00-$20.00 every time we go. That’s real dollars – and those savings add up. There you have it. Now you are armed with a plan that will help you add real dollars back into your budget. If you stick with the plan, these savings can super-charge your savings goals. 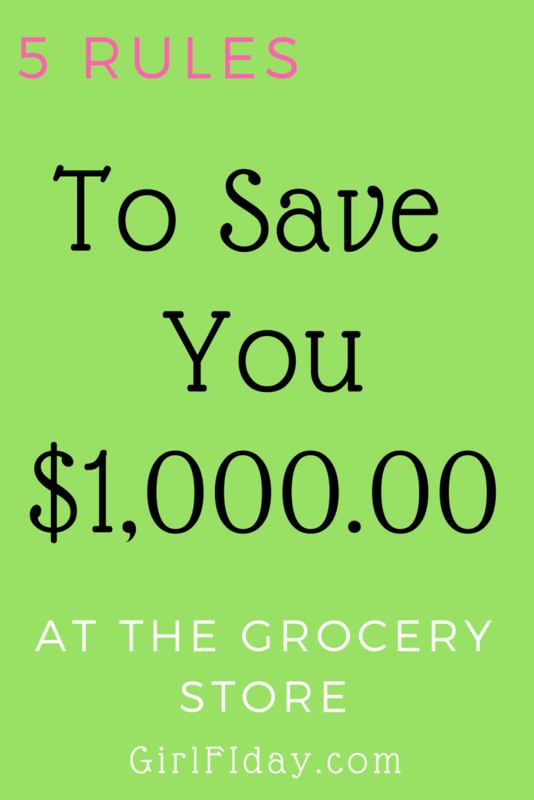 I am almost embarrassed to tell you that when we took a good look at our food spending, we were wasting over $1,000.00 a month on groceries and eating out. $1,000.00! It’s insane. But we don’t realize how quickly a trip here and there, a trip through the drive-thru because we are exhausted, or lunch out with friends multiple times a month adds up. You do not have to deprive yourself – that’s not what this exercise is about. It IS about setting a goal to save and finding a way to do it with the resources you have. By shopping intentionally, you can easily put hundreds back into your wallet and that should make you very happy! So many good tips in there! It’s even more relevant because this literally happened to us thins week…we’re like “we’re spending HOW much on groceries!!??”. So it’s time to rein it in! It really was because I’d been meal planning and listing…but it stopped there. I really didn’t calculate out the grocery trips. And the biggest thing was all the EXTRA grocery trips during the week for the 2 things that end up being 6 things. Ug! It’s a crazy cycle that’s hard to break! Good luck on making a new commitment! It IS hard, especially when all of us are so busy. Just keep focused on the bigger goal of saving and then come back every few months and see if you are staying on track – or need to make new adjustments.